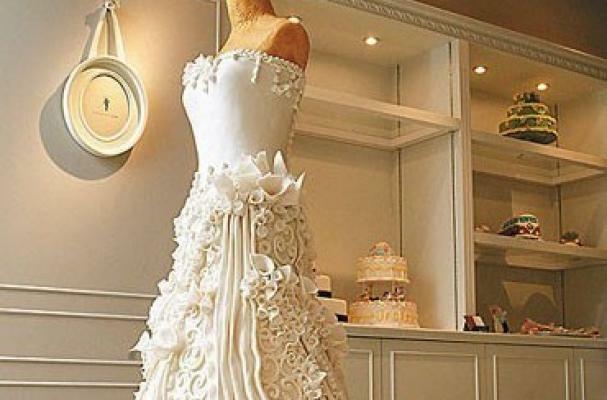 This stunning wedding dress cake is truly food as art. It is so intricately decorated that it almost appears wearable. The bodice is designed simply with a few details while the skirt is covered in swirls, ridges, and calla lilies. 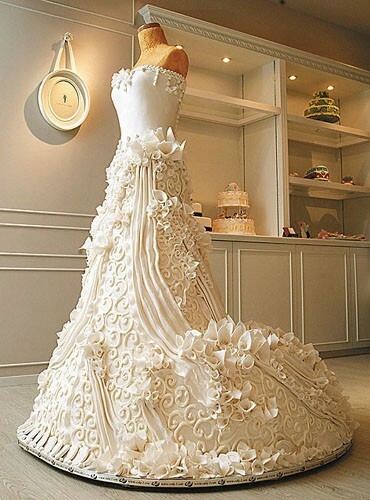 This wedding dress cake almost looks good enough to wear. This is absolutely stunning, I am in awe. Amazing work, keep up the creativity! Wow that's amazing! Love seeing creativity and originality like this. Awesome. Oh my goodness this is amazing!!! That's brilliant! Do you have any other details, like who made it, who it was made for, or anything else? Ridiculously fantastic. Beautiful work of art. Oh wherever did you find this? I would love to know who made it. It's spectacular! that is so amazing , you are so talented , i cant even guess at the price !